Hello everyone! 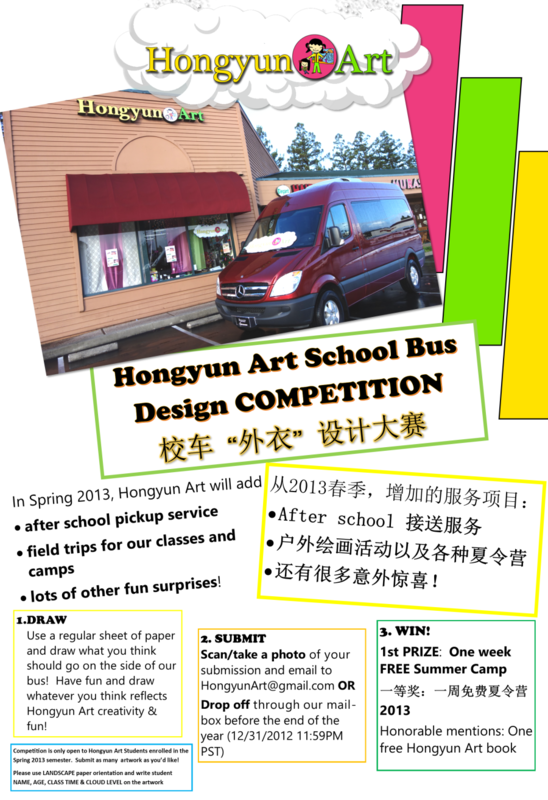 We have chosen our Bus Design Competition Winners! That's right, we didn't just choose one entry but three! Each of these three student's entries contributed a great deal to the overall design of the bus graphics! Our Red Cloud students worked very hard over the holidays to help Hongyun design the most wonderful and creative bus around! It truly will be a unique rolling work of art that every Hongyun Art student will be proud of! Each winner will receive 1 free week of summer camp (excludes Mindy Comic Camp)! We also have quite a number students that received honorable mention since their artwork was partially used in the overall design and will receive one Hongyun Art Book of their choice! Great job everyone and congratulations to all of our winners! We can't wait to see the most creative and fun school bus around!